Nancy Griffin travels to Chile and finds a beautiful country still celebrating its Irish founding father. Chile is a long, narrow, mountainous, beautiful country on the Pacific Ocean, its tip so far south that the last water to be spied from the mainland is the Straits of Magellan and the next landfall after the islands just below them is Antarctica. The Chilean national language is Spanish, but enclaves of different Native American languages still persist. English is not widely spoken, being a second language mostly for urban dwellers or the emerging international business community. So remote from Ireland and Irish culture is Chile that it seems incredulous to find that the most revered person in its history is an Irishman. And yet, coming from the airport into downtown Santiago, surrounded by the snow-capped Andes, with the bus passing a long, colorful line of “huasos” (cowboys) wearing the traditional horseman’s long poncho or “manta de castilla” headed for a Chilean rodeo, suddenly, incongruously, there it is: Avenida O’Higgins. I remember Símon Bolívar as the liberator of Bolivia — they even named the country for him — because the nuns mentioned him when I was in grammar school. Maybe they told me about O’Higgins, too, but back then, the sound of an Irish name in Boston was so expected that perhaps it slipped by me unnoticed. Spotting the street name made me laugh at first, then wonder. Finally, near the city center on the almost-two-mile-long Avenida O’ Higgins, we came to a statue of Libertador Bernardo O’Higgins which identified him as the liberator of Chile. The street also boasts a statue of José de San Martín, another military leader and republican. Turns out, San Martín and O’Higgins, who were boyhood friends, collaborated and fought in concert with Bolívar. Together, the trio eventually ended Spanish role in South America in the early 19th century. And while Bolivar’s dream of a united Latin America did not succeed, he is credited with independence for Bolivia, Panama, Colombia, Ecuador and Venezuela, while San Martín and O’Higgins led the battles that liberated Peru and Chile. O’Higgins was the son of Ambrose Bernard (later known as Ambrosio) O’Higgins, an Irish engineer born in Ballinary, County Sligo or County Meath — depending on the source — who was working for the Spanish colonial service as Intendant of Concepción at the time of Bernardo’s illegitimate birth in 1778. 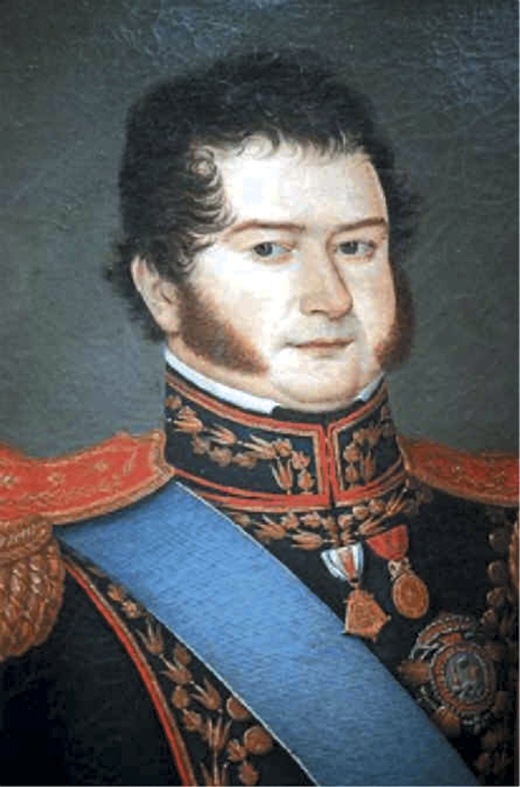 Later Ambrosio became Governor of Chile and Viceroy of Peru. He took the boy from his Chilean mother Isabel Riquelme’s Creole family and arranged for Bernardo’s formal education including schooling in England, where his studies sowed the seeds of the red-headed Irish-Chilean’s republicanism. After years of war that finally ended in liberation in 1817, Bernardo O’Higgins became dictator or “supreme director” of Chile, intending to raise cultural standards and improve education for all citizens before turning the government over to them. With the help of San Martín and Thomas Cochrane (later 10th Earl of DunDonald), he created the Chilean navy and the accumulation of troop ships. However, he spent a lot of the state’s money to finance San Martín’s last expedition to liberate Peru, and some say he proved a better general than an administrator. Some O’Higgins appointees proved corrupt, prompting a revolt after which he was asked to resign. However, others say he was ousted after five years because he alienated the ruling elite families with his social and economic reforms. In 1823, he left the country with his mother, his sister and his son, to settle in Lima. Despite his failure at governing, his legend as liberator is assured if only by the number of attractions bearing his name. In Santiago, besides the street and the statue, a large city park is named for him. The greater region containing Santiago is known as Region Bernardo O’Higgins. The largest of Chile’s national parks is the sprawling Parque Nacional Bernardo O’Higgins located in the 12th of Chile’s 12 administrative regions, the southernmost region known as the Magellanes which is home to Patagonia, Tierra del Fuego, the Straits of Magellan and Cape Horn. But surely no one should travel to Chile just to note the oddity of an Irish name or two (Santiago also has Avenida Presidente Kennedy) in a place so heavily influenced by its Spanish conquerors, although a tour of things named for O’Higgins might prove an interesting and comprehensive trip. This unusual country has something for everyone — the rugged adventurer, the naturalist, the laid-back tourist, or the skier. The first thing you notice about Chile is that the people are helpful, warm, considerate and as friendly as the Irish. If your Spanish is minimal; don’t be afraid to try it out, they’ll be encouraging and help you figure out what you need. But before you depart for Chile, remember to ask for a seat on the left side of the plane heading south, in case you’re flying overnight and can awaken to the sight of dawn breaking over the Andes as you fly by their peaks. It was my introduction to Chile and one I’m not likely to forget. Arturo Merino Benitez airport near the capital, Santiago, is clean, efficient and glassily modern, affording wide-angle views of the surrounding scenery. Santiago, an inland city of five million residents, is easy to reach by bus from the airport. The city has great public transportation including a modern underground metro and thousands of yellow taxis. Visitors will spot predominantly Spanish-influenced architecture along Santiago’s well-laid-out grid, but building styles range from simple houses to modern glass-fronted commercial buildings, and include the French beaux-arts facade of the Biblioteca Nacional on Avenida O’Higgins. The six-million-volume National Library, dating from the early 20th century, hosts one of the biggest book collections in Latin America as well as paintings by beloved Chilean artists. Tours of the city will show off the Biblioteca, as well as the Club Hipico horse-racing track, government palaces, the Pre-Columbian Art Museum and the city’s historical center, the Plaza de Armas. The neighborhood known as Barrio Bellavista is often called Santiago’s “Paris Quarter” for its dense collection of restaurants, nightclubs, craft shops and art galleries. Don’t miss the colorful down-town market, Mercado Central. The Palacio de la Moneda — formerly the mint and now the Presidential residence — is situated on one side of the vast Plaza de la Constitución, alongside some of the city’s glass skyscrapers and historic colonial churches. In this city built on and ringed by the majestic Andes, travelers may visit the huge Parque Metropolitano, often called Cerro San Cristobal for the highest of the three peaks it contains. A funicular takes visitors to the top of the highest hill, 650 feet above the city and 3,000 feet above sea level, where a 46-foot statue of the Virgin of the Immaculate Conception rises another 75 feet on her pedestal. If Santiago’s well-known smog is at bay, the hilltop offers the best panorama of the city sprawling below, including one from a gondola that runs between two of the highest points. But that’s not all. The same heavily forested city park offers a zoo, a swimming pool, snack bars, a full restaurant, gift shops, a craft shop and lots of friendly, wandering city dogs. Families picnic there, while mountain bikers, hikers and runners exercise on the many trails. Halfway up San Cristobal is the Enoteca Wine Museum, complete with tastings. The nearly 200-acre Parque O’Higgins southwest of downtown offers a small lake, tree-lined walking paths, grassy fields, gardens, swimming pools, a skating rink, tennis courts and several restaurants. The park is also home to the Plaza de las Artesanias, where as many as 10 dozen artists and artisans both create and sell their art. Three museums are located within its perimeters, dedicated to Chilean insects, animals and the history of the Chilean farmer. On another and smaller hill, Cerro Santa Lucia on Avenida O’Higgins, sprawls a historic, once-grand yellow castle, gardens and a fountain. At the foot of the hill, once called the “Huelen,” Spain’s Pedro de Valdivia founded Santiago in 1541. Visitors may hike up the wooded paths and the castle steps, and through the gardens. Early residents used the fortified site as a refuge from attacks from the Mapuche people. Chileans love coffee and there’s plenty of good java to be had in Santiago’s coffee shops and kiosks. Besides the open markets, shoppers can head for modern indoor shopping malls. A range of restaurants cater to every taste, and expect lots of salmon on most menus. Or you can head out of town to see some of the other, wildly different aspects of this 3,000-mile-long country. Puerto Montt is the salmon-farming capital of Chile, and perhaps the world. Founded in the 19th century by German immigrants, the oceanside city still shows its old German influence in its architecture and restaurants such as the Club Allemande. Murals line the walls along the city’s main road. An ocean-front boulevard with an unfettered view where lovely, reasonably priced small hotels face the sea, proves the old resort’s heritage. On the way out of town, a long marketplace of open stalls features crafts of every kind, including hand-spun yarn and handwoven items. Within reach, and view, of volcanoes, Puerto Montt is a mere 20-minute ferry ride from Chiloe, Chile’s largest island, known as the “Island of Legends.” The last place reached by Europeans, it’s historically an agricultural island with rich topsoil measured in feet, not inches, where Native Americans may be seen walking barefoot, leading oxen down the road. Before the Spanish arrived, Chile’s residents were mostly Atacama, Diaguuita and smaller indigenous groups in the northern Atacama Desert regions. The Mapuche or Araucanians inhabited the central valley region, where most still live. However, most of Chile’s residents are now mestizo, or of mixed European descent, and not just Spanish, often German and Swiss. Chiloe Island has cities, too, and a growing tourist industry. All the island’s bays contain salmon pens and gaily painted fishing boats which serve the burgeoning salmon industry. See this island before the salmon industry achieves its goal of building the world’s longest bridge to it. Further south, a two-hour small-plane ride from Puerto Montt — itself two hours south of Santiago by plane — lies Punta Arenas, the city at the end of the earth. A century ago, it was the richest city in Chile. Today it is an international port for scientists and fishermen headed for the Antarctic; the docks at various shipyards — sometimes Chilean Navy yards — may be host to Russian, Ukrainian, Polish, Japanese and American vessels at the same time. A post halfway up a hill in Punta Arenas sports arrows pointing to cities all over the world and notes the distances to them. It’s a popular spot for viewing the Straits of Magellan and offers a wide-angle glimpse of the various docks and ships in port. A statue of Bernardo O’Higgins marks the base of a broad avenue whose wide center strip is a multi-level park. This city also boasts reasonably priced, comfortable hotels with great menus. One is in a former Spanish mansion whose former owners had a bloody history of Native American oppression. Punta Arenas is known as the “Gateway to Patagonia.” In a small downtown park, a statue of Hernando Magellan (the Portuguese navigator who discovered the straits named for him) stands atop a broad pedestal. On a lower level of the pedestal reclines a carved stone statue of a Native American, called simply “Patagonia.” Rubbing his big toe for good luck has become a tradition, and children can often be seen climbing on the statue for this purpose. In this southernmost region, besides departing for Patagonia or Tierra del Fuego, tourists may visit parks (including Bernardo O’Higgins Park) to glimpse glaciers, many-colored mountains, vast lakes, a penguin colony and more than 25 species of mammals, 200 different indigenous plants and 105 varieties of birds — including the condor. Remember, the seasons are reversed here, and the country’s majestic beaches (Bahia Inglesa in the north, Pichilemu in the center — Bernardo O’Higgins’ region and a surfer’s paradise — and Pucon in the south, next to the Villarrica volcano) are warm in our winter. During an American summer, heat sufferers can take to the hills for skiing in Chile’s winter. Punta Arenas boasts the southernmost of the country’s ski centers. The climate here, the southernmost city on earth, is cooler than in the more moderate central and the always-warm northern regions of Chile. During a September visit, skiers were still enjoying spring skiing in Punta Arenas, although the snow was beginning to soften and had disappeared from all but the tops of the hills. It’s windy pretty much all the time there, but the wind blows strongest in summer. Editor’s Note: This article was originally published in the August / September 2004 issue of Irish America magazine.